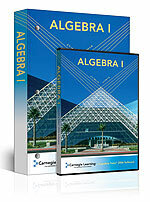 Carnegie Learning's Algebra 1 curriculum consists of two parts: textbook and software. It is truly a unique curriculum and unlike anything I've seen before. One can see that a lot of work has gone into creating this product. The software is the most innovative part in this curriculum; however the textbook also follows somewhat different ideas and principles than standard algebra textbooks. The software component is called Cognitive Tutor. It provides the student intelligent practice with everything in Algebra 1 curriculum. The problems that the electronic tutor gives the student range from simplifying expressions and solving equations to modeling real-world situations. It is a "tutor": for all problems, the software includes on-demand hints that advance from general hints to more specific ones. It is cognitive: the software adapts the problems to the student's performance, and sometimes provides hints for the student ("just-in-time help"). I especially liked the grapher problems. The student is presented with a problem situation from the real world, such as work hours & pay, time & distance, or number of packages & price. The students need to choose the variables, build an algebraic equation to model the situation, answer questions about specific values of the variables, and make a graph using the Grapher. The student either fills in empty boxes, chooses from multiple choices, makes graphs, and so on. The problems are quite varied. The problems advance step-by-step towards more open-ended ones. For example, when learning how to solve equations, at first the student only chooses which transformation to do to both sides of the equation, and the program does it. Lateron, the student has to choose the transformation and do it (type in the transformed equation). The problems in the software cover the whole scope of an algebra 1 curriculum. See a few examples below. Click the images to enlarge them. The student chooses which transformation or simplification to apply to the equation. The first step was to use distributive property, which is under "Simplification" menu. The student first chooses which graphing method to use for the boundary lines of each inequality. Then the grapher program allows him to graph the lines. That is already done here. Then, the student chooses how to do the shading. The student fills in the boxes to build a proportion from the word problem. The student chooses a graphing method and graphs the two lines; then finds their intersection. The student finds and models squares and square roots. This is a real-life situation about shooting up a bottle rocket, but it is a dud and falls back to the ground. The height versus time graph is a parabola. The student carefully fills in the table the lengths of sides of the triangle to study the Pythagorean theorem. A scenario of exponential growth - lilies growing in a pond that double in area every day. The student is supposed to spend about 40% of learning time with the software and the rest with problem-solving activities from the worktext (textbook), so while it might appear to you from all the above that the software is the most important part, it is about equally important as the book. I only saw the first chapter of the textbook. It contains extended investigations or problem situations in which the student learns by guided exploration. The problems use real-world situations and they are designed so as to emphasize connections between verbal, numeric, graphic, and algebraic representations. The textbook would be better described as a worktext. It presents you with a scenario and then problems and questions follow. In between are short teaching boxes that explain terms, notation, or concepts. In fact, the explanations may even be in the end of the lesson. In short, all learning is occurring within a context of a real-life problem. This curriculum is different from many other algebra curricula in two main aspects: because it uses software, and because the textbook is based upon investigations instead of "lecturing". These features do make the curriculum excellent though! However, it is not well-suited to be used by parents who don't know algebra. There needs to be a teacher who can guide the student through the explorations and who understands beforehand what the investigation is coming to and what are the goals of such instruction. The program makes the student to go through the problems in order and automatically advances him to the next level when the software determines he is ready. This is good for most students, but can be a constraint as well. However, the teacher can change the student placement manually. Sometimes I had to stop and think to figure out what the program wanted in which box, or in which order I needed to do things before the program would let me proceed. In one instance I did not like the mathematical approach: the chapter about proportions. In another place (simplifying rational expressions), I thought the placing of text and of the empty boxes made the whole problem to look very confusing. But the program is in constant development, and little things like that are likely to be changed based on user feedback. Carnegie Learning Cognitive Tutor Algebra 1. Website: Carnegie Learning Cognitive Tutor.